I am preparing for a new series of sermons and leading a small group through the Gospel of Luke. Right now I’m refreshing my big picture understanding – so I’ve just finished reading through the entirety of Luke in J.B. Phillips’ translation. 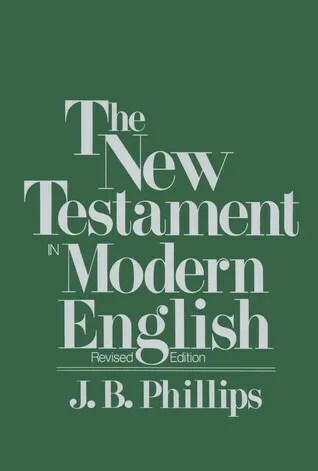 JB Phillips’ The New Testament in Modern English book cover for the Revised Edition. In my personal studies of Scripture I have found I can sometimes go into “automatic” mode when reading Scripture – a mode that feels like it already knows what the text is saying or even worse that just wanders off elsewhere while my eyes still parse the text. To overcome this dilemma I frequently use different translations of Scripture. I tend to do devotional reading in a single version over a period of time – till it has become familiar and then move to another translation – and so on. After a while away from a translation I find the words are again crisp and fresh. When I’m preparing a sermon I like to read from as many different translations as possible. While there are various levels of literal fidelity to the original languages in translations, every translation is to some extent an interpretation or commentary upon the Scriptures. Reading different versions highlights the different ways different individuals have thought about these particular passages in a concise way which can then be further explored via commentaries and other resources. J.B. Phillips was an Anglican clergyman who began translating some of the Scriptures into “modern” language during World War II. His ministry was in a heavily bombed area and the translation occurred under this recurring threat. His translation was well-liked, among his admirers being C.S. Lewis. He also saw his translation being used “authoritatively” and felt that it was not good enough so he went about retranslating it. Phillips completed the entire New Testament as well as some books of the Old Testament. His NT is best known. Throughout his life he struggled with depression and reflects a theological perspective more reminiscent of William Barclay’s “liberal evangelical” than fundamentalist or evangelical generally. You can read more about his life on Wikipedia. Michael D. Marlowe has written a fairly extensive review of the translation along with some analysis of Phillips’ more heterodox views for those looking to evaluate a little more deeply the merits of the man and the translation. Another interesting article on the same topic is available from the Tyndale Society and authored by Hilary Day. As I noted earlier, I read from numerous translations – I’ve spent time with the KJV, NKJV, NIV, NLT, ESV, HCSB, LEB, The Message, The Living Bible – and the list could go on for quite some time. I do not necessarily see one translation as superior to the other but each providing insights that another may not have been able to highlight. I use the ESV, LEB, NASB when working with the details, but utilize the NLT and NIV when working more big picture. So, I am not suggesting this should be your bible – but that it is a good bible. If you come across passages that sound different from what your more literal bible says – compare them, do some research – one often learns fascinating things because of the differences in translation. I find Phillips’ translation to be fairly literal overall but at times it strays significantly into thought-for-thought territory. The language is contemporary and has that British flare to it which brings a different taste than our American translations. Phillips’ is good at making the text flow and showing the connections between texts. If your translation feels a little stale – give it a try – or any one of the numerous other excellent translations/paraphrases out there…just know what you are getting (e.g. The Message is a very free-from paraphrase, I still think it has a place, but it is for that place and not every place). You can read the Phillip’s New Testament online for free, though I am unsure that this edition is the same as the translation I read (1972), it may be the earlier and looser translation he made. It is available from both the Christian Classics Ethereal Library and Bible Gateway. You can also purchase a newer edition (the one I read) from Amazon. Next story I Want More Sugar? Previous story I Spent Too Much Time Researching Vacuums.